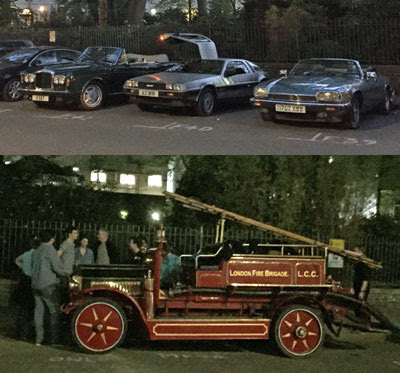 The strangest (and longest running) car event in London. One of London’s stranger races is the Miglia Quadrato — in which teams combine horsepower with brain power, as they dash around the City of London (some of them in old fashioned fire engines) through the middle of the night, searching for clues. I participated last year and it was a LOT of fun. I would love to get a group from Waterloo Classics to join this year. Who would like to join? Registration for this even must be done by POST only (very old school) and received by May 6th. The 2017 Miglia Quadrato is the fifty-seventh such event and will run on the night of 20/21 May. This is a night time motoring event. It is unique in that it takes place entirely within the City of London. The challenge is to navigate on a 1:10000 map and to locate points to within a ten metre square – where the answer to a question should be sought. There are no cryptic or catch questions – but that is not to say the task is easy. Indeed, many seasoned crews return each year and competitors with full rally experience will be as challenged as those with no such experience. It truly is an event for all. A history of fifty years attests to that. With its accessibility to crews of up to six it can be a very enjoyable social event. But if you prefer the two-crew format there is a separate classification for this. Please note, the cut off date for entries is earlier than usual and we will not be accepting entries received after that date. Every year we get entrants from around the country. The fact that many travel considerable distance and return each year is another indication of its appeal. Sadly, however, the number of entries has dropped and is close to a non-viable level. Unless we are able to attract in excess of sixty starting teams then this may be the very last Miglia Quadrato. If you value the event, then it is in your interest to attract more entries – either returnees or fresh blood. We would really appreciate your help with this. The event is run under a Certificate of Exemption and we have approval to accept entries from the public – they do not have to be affiliated to any motoring club. Last year your efforts got us to within one of the target – if each past entrant introduces one new team we can survive: please don’t leave it to others. Entry is open to all – why not challenge colleagues at work?